Key difference: MPEG stands for the Moving Picture Experts Group. MPEG1 was originally released in the year 1993 and is effectively a compression system for audio and video files. It is usually used to save videos with sound on a hard disk and CDs. It is even used for digital cable/satellite TV and digital audio broadcasting. However, it is usually used for low resolution images. 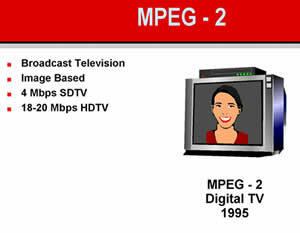 MPEG2 was released in 1995 and is effectively the successor to MPEG1. It is quite similar MPEG1, and aimed to improve on the previous format. MPEG2 includes generic coding of moving pictures and associated audio information. MPEG stands for the Moving Picture Experts Group. It is a working group of experts that was formed in 1988 by ISO and IEC. It was a joint initiative between Hiroshi Yasuda of the Nippon Telegraph and Telephone and Leonardo Chiariglione. Chiariglione has served as the group’s Chair since the group’s inception. The aim of MPEG was to set standards for audio and video compression and transmission. By 2005, the group has grown to include approximately 350 members per meeting from various industries, universities, and research institutions. MPEG-1 (1993): Coding of moving pictures and associated audio for digital storage media at up to about 1.5 Mbit/s (ISO/IEC 11172). Designed to compress VHS-quality raw digital video and CD audio without excessive quality loss, making video CDs, digital cable/satellite TV and digital audio broadcasting (DAB) possible. It includes the popular MPEG1 Audio Layer III (MP3) audio compression format. MPEG-2 (1995): Generic coding of moving pictures and associated audio information (ISO/IEC 13818). Describes a combination of lossy video compression and lossy audio data compression methods, which permit storage and transmission of movies using currently available storage media and transmission bandwidth. MPEG-3: Dealt with standardizing scalable and multi-resolution compression and was intended for HDTV compression but was found to be redundant and was merged with MPEG2. MPEG-4 (1999): Coding of audio-visual objects. Includes compression of AV data for web (streaming media) and CD distribution, voice (telephone, videophone) and broadcast television applications. It includes the MPEG-4 Part 14 (MP4). MPEG-7 (2002): Multimedia content description interface. Not a standard which deals with the actual encoding of moving pictures and audio, like MPEG1, MPEG2 and MPEG4. It uses XML to store metadata, and can be attached to timecode in order to tag particular events, or synchronize lyrics to a song. MPEG-21 (2001): Multimedia framework. It is aimed at defining an open framework for multimedia applications. Based on definition of a Digital Item and users interacting with Digital Items. MPEG1 was originally released in the year 1993 and is effectively a compression system for audio and video files. It is usually used to save videos with sound on a hard disk and CDs. It is even used for digital cable/satellite TV and digital audio broadcasting. However, it is usually used for low resolution images. MPEG1 is a lossy compression. A lossy compression means that while saving a file, there is a slight loss of quality due to compression. With each re-save there a slight loss of quality due to compression. Hence, it is not the greatest format in case one needs to keep making numerous edits and re-saves to the image. Still, if one only makes a few edits and the file is saved in a high quality format, the slight loss of quality due to compression is mainly negligible. An advantage to using this format is that due to compression, the file will take up less space for data storage. In MPEG1, the compression ratio of video without losing too much quality is 26:1 and the ratio or audio is 6:1. As this compression rate saves a lot of space, this format has become quite with the average user. This is only further affected by the fact that the MPEG1 has a wide compatibility. Some of the most popular file formats under MPEG1 include .mpg, .mpeg, .mp3, etc. 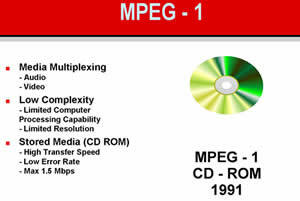 MPEG2 was released in 1995 and is effectively the successor to MPEG1. It is quite similar MPEG1, and aimed to improve on the previous format. MPEG2 includes generic coding of moving pictures and associated audio information. It improves the compression factor and enhances the capabilities of MPEG1, so that MPEG2 is mainly used for DVD videos, as well as broadcasting digital television including terrestrial, cable and satellite. Additionally, MPEG2 also incorporated support for Variable quantization and VBR. MPEG2 also has a more complex encoding algorithm, due to which it is in incompatible with MPEG1. Hence, MPEG1 players are not able to decode and play MPEG2 files.